1 Cook the potatoes in boiling water and after 2 mins add the green beans. Cook for 4-5 mins until just cooked and leave to cool. 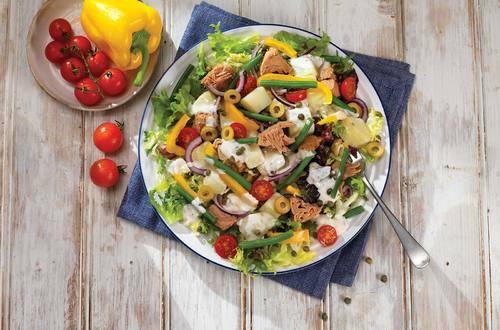 2 Mix all the vegetables with the tuna, capers and olives. 3 Pour over Hellmann’s Classic House Dressing and mix gently. 4 Serve on a bed of mixed salad leaves, top with the cherry tomatoes.